Imagine a future where a building’s energy comes from its windows. Many scientists have worked towards that future in the lab, but now five scientists from Los Alamos National Laboratory have demonstrated solar window technology can indeed be scaled up. Instead of palm-sized models, they created solar windows large enough to power entire buildings. “Luminescent solar concentrators (LSCs)” are a key component of the team’s solar windows,” according to a statement from the National Laboratory. LSCs can collect sunlight over large areas, and function as “light-management devices.” They collect sunshine via colloidal quantum dots, which have beneficial properties such as the ability to withstand light hitting them over and over. Colloidal quantum dots have a “high photostability,” which means sunlight won’t break them down. As detailed in their research published online by Nature Energy this week, the scientists hope the use of LSCs could reduce solar power costs. 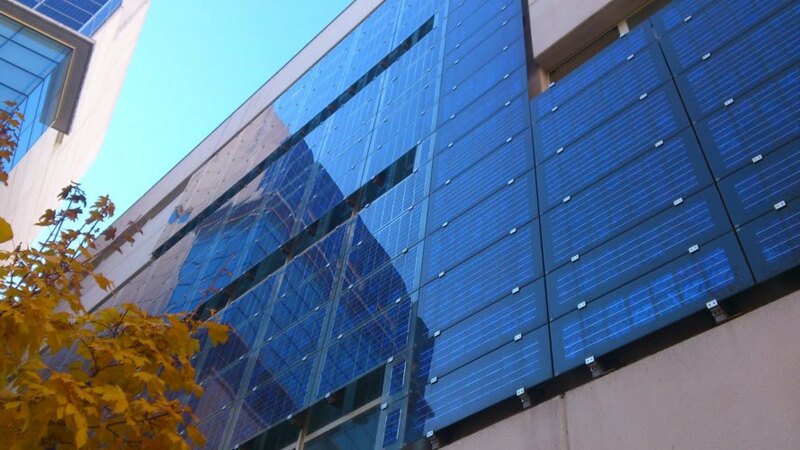 Their solar windows likely wouldn’t need as many “expensive photovoltaic materials” as other solar modules. They also noted solar windows would be incredibly beneficial for urban spaces, where there may not be as much room for solar panels. UbiQD is licensing this tech from Los Alamos National Laboratory and developing several products. Inquiries for pilot projects or alpha testing can be sent to [email protected], or send us a message through out website. How can I get them? Are they on the market yet? If not, need a beta tester? Los Alamos National Laboratory scientists demonstrated solar window technology could be scaled up for buildings. Their technology could enable buildings to receive power from their windows. Luminescent solar concentrators are a key component of the windows and can collect light over a large area.